The ET90215CR 365-Day Astronomic Energy Control enables independent programming for each day of the year to provide flexibility for applications where load switching differs frequently. The time switch provides dependable and uncomplicated performance, plus to-the-minute programming for accurate load control and reduced energy costs. Holiday or exception programming is available to allow temporary overrides of repeating schedules. Control buttons provide manual control of each circuit independently, regardless of the operating mode. The time switch features a 100-hour supercapacitor to provide time keeping and automatic carryover without the need for a battery. External devices, such as wall switches and occupancy sensors, can be used as input signals to the time switch, allowing a manual ON, timed OFF capability. Programming is simplified by a USB port for easy copying and backups. The Intermatic ET90215M is a 2circuit time switch mechanism. This model automatically detects input voltages between 120 and 277 VAC. You can preset up to 4,000 events, holidays scheduling is also available. For easy updates, schedule backup and program transfer, this switch mechanism features a USB connection. Also, it has a schedule review mode and a password protection. The Intermatic ET90215CRE is a 365day astronomic energy control with Type 3R steel enclosure. This model features 2 circuits. In order to provide flexibility for applications, this astronomic energy control is designed to enable independent programming for every day of the year. For reduced energy costs and accurate load control, this model provides totheminute programming and uncomplicated performance.Each circuit can be manually controlled independently by control buttons, regardless of the operating mode. There is no need for a battery because the time switch has a 100hour supercapacitor which provides automatic carryover and time keeping. External devices are intended to allow a manual ON, timed OFF capability and can be used as input signals. For easy copying and backups, a USB port simplifies programming. 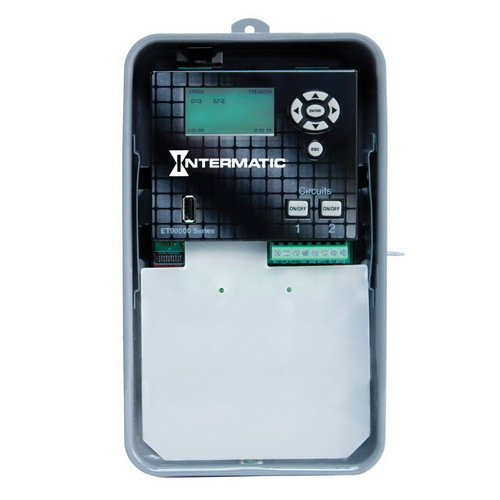 The Intermatic ET90215CE is a 365day Astronomic energy control with type 1 steel enclosure. This ET90215CE features 2 circuits. In order to provide flexibility for applications, this Astronomic energy control is designed to enable independent programming for every day of the year. For reduced energy costs and accurate load control, this ET90215CE provides to the minute programming and uncomplicated performance. Each circuit can be manually controlled independently by control buttons, regardless of the operating mode. There is no need for a battery because the time switch has a 100hour super cap AC it or which provides automatic carryover and time keeping. External devices are intended to allow a manual on, timed off capability and can be used as input signals. For easy copying and backups, a USB port simplifies programming. The Intermatic ET90115M is a 1circuit time switch mechanism. This model automatically detects input voltages between 120 and 277 VAC. You can preset up to 4,000 events, holidays scheduling is also available. For easy updates, schedule backup and program transfer, this switch mechanism features a USB connection. Also, it has a schedule review mode and a password protection. 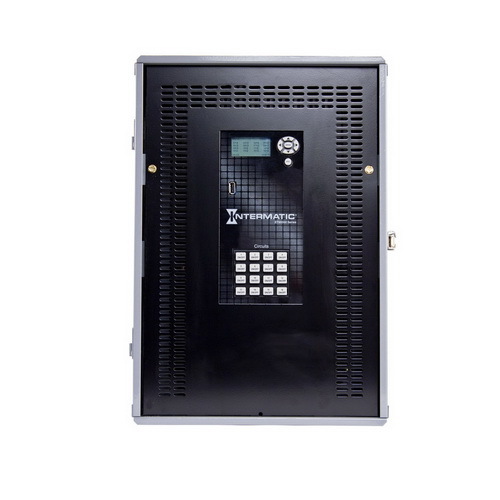 The Intermatic ET90115CRE is a 365day Astronomic energy control with type 3R steel enclosure. This ET90115CRE features 1 circuit. In order to provide flexibility for applications, this Astronomic energy control is designed to enable independent programming for every day of the year. For reduced energy costs and accurate load control, this ET90115CRE provides to the minute programming and uncomplicated performance. Each circuit can be manually controlled independently by control buttons, regardless of the operating mode. There is no need for a battery because the time switch has a 100hour super cap AC it or which provides automatic carryover and time keeping. External devices are intended to allow a manual on, timed off capability and can be used as input signals. For easy copying and backups, a USB port simplifies programming. The Intermatic ET90115C 365-day astronomic time switch can be programmed to control one circuit with up to 4,000 events plus holiday schedules. Its 100+ hour supercapacitor ensures you'll never lose the date and time during a power outage, while the time switch's non-volatile memory will protect programming indefinitely. This timer also features a USB connection, making uploading and downloading programs a breeze! The ET90215C 365-Day Astronomic Energy Control enables independent programming for each day of the year to provide flexibility for applications where load switching differs frequently. The time switch provides dependable and uncomplicated performance, plus to-the-minute programming for accurate load control and reduced energy costs. Holiday or exception programming is available to allow temporary overrides of repeating schedules. Control buttons provide manual control of each circuit independently, regardless of the operating mode. The time switch features a 100-hour supercapacitor to provide time keeping and automatic carryover without the need for a battery. External devices, such as wall switches and occupancy sensors, can be used as input signals to the time switch, allowing a manual ON, timed OFF capability. Programming is simplified by a USB port for easy copying and backups. The Intermatic ET90115CR 365-day astronomic time switch can be programmed to control one circuit with up to 4,000 events plus holiday schedules. Its 100+ hour supercapacitor ensures you'll never lose the date and time during a power outage, while the time switch's non-volatile memory will protect programming indefinitely. This timer also features a USB connection, making uploading and downloading programs a breeze! * Compared to ET90115C, this model has a NEMA 3R Raintight Outdoor Enclosure. The ET90415CR 365-Day Astronomic Energy Control enables independent programming for each day of the year to provide flexibility for applications where load switching differs frequently. The time switch provides dependable and uncomplicated performance, plus to-the-minute programming for accurate load control and reduced energy costs. Holiday or exception programming is available to allow temporary overrides of repeating schedules. Control buttons provide manual control of each circuit independently, regardless of the operating mode. The time switch features a 100-hour supercapacitor to provide time keeping and automatic carryover without the need for a battery. External devices, such as wall switches and occupancy sensors, can be used as input signals to the time switch, allowing a manual ON, timed OFF capability. Programming is simplified by a USB port for easy copying and backups. The Intermatic ET91615CR 365-day astronomic time switch can be programmed to control an amazing 16 circuits with up to 4,000 events plus holiday schedules. Its 100+ hour supercapacitor ensures you'll never lose the date and time during a power outage, while the time switch's non-volatile memory will protect programming indefinitely. This timer also features USB and Ethernet connections for easy programming, even using PC tools! The Intermatic ET90815CR 365-day astronomic time switch can be programmed to control eight circuits with up to 4,000 events plus holiday schedules. Its 100+ hour supercapacitor ensures you'll never lose the date and time during a power outage, while the time switch's non-volatile memory will protect programming indefinitely. This timer also features USB and Ethernet connections for easy programming, even using PC tools! The ET90000 Series combines powerful and intuitive scheduling with truly maintenance-free convenience. The PC App and Mobile App provide real-time remote control, and the USB connection and Ethernet capabilities enable in-field updates.